I know we are now bombarded with all these websites that compare everything from home insurance to cars, but I just had to tell everyone about this supermarket compare site as it’s one of the best websites I have used and it really will give you help you find supermarket savings. 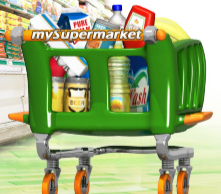 Check out mySupermarket.co.uk. I really wanted to know if I could save money by swapping supermarkets and I came across this website that allowed me to compare supermarkets without having to go shopping at all of them. A few simple steps later and I had my answer – I really could make a supermarket saving by swapping supermarkets. You just fill your online trolley at Asda, Tesco, Sainsbury’s or Ocado, through the MySupermarket website, pick the supermarket you normally use and then it will compare supermarkets and tell you what you could be saving if you swapped. You only need to do a few standard items and you will start to see how it all works. Once you have loaded all you items it will post the order across to the supermarket that’s best for check out. I quickly found out that my supermarket saving could be far greater if I shopped at an alternative supermarket, it was a real eye opener. That was just the start of my delight when I used mySupermarket.co.uk. The website also has access to the supermarket data so you can load your shopping every time you order and compare who you are shopping with to take advantage of the offers you would otherwise not have known about.